We love making unique gifts and we LOVE photos of the kiddos! What is more perfect than a combination of both. Treat.com recently offered us 3 card and 3 mugs to check out their gift collection. I know what you are thinking . . . Treat.com has a gift collection??!!!?? I shop their ALL the time. In fact, I JUST ordered my son's birthday invitations from there (and sent a personalized one to each person invited), and I did not see all of the amazing gifts!! 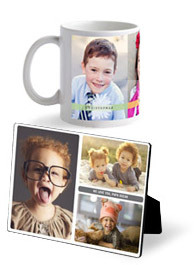 Learn more about the gifts here: http://www.treat.com/gifts.htm When you check out with a card, you can add a mug, easel, or even a gift card to your personalized card! What a great surprise it would make for someone's birthday or upcoming Easter! Want to win your OWN gift sets? The winner of this giveaway will receive 3 cards and 3 mugs to send to their favorite people! MamaBreak was given credits to make their own mugs and cards in exchange for sharing the review and giveaway with our audience. We did not receive any other type of compensation. As always, our opinions and experiences are our own. I like Colors of Love. I like the "Fat Free" birthday greeting card -Amy D.
The "Famous Places" card is my favorite. I love the Bright Message Easter Card! I like the Springtime Wishes. I like the blank cards, gives you a chance to express your own emotion. I love the Fragrant Moment card. I love the joyful jump since my husband is looking for a new job! I love the Sweet Filigree by Magnolia Press! I like the Whatever it Takes Mother's Day card. I love the all about me birthday cards! Congrats on your engagement.Thank you!